Designed specifically for simple, cost-effective transfer printing, the C831TS digital color printer delivers high-quality color graphics and text. The C831TS features High Definition print and Single Pass Color ™ technologies, and produces impressive results. This compact printer prints beautiful color on transfer sheets used with a wide range of fabrics. 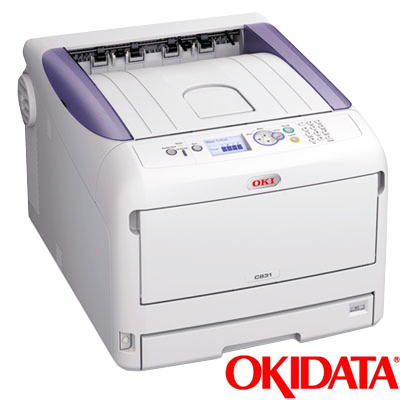 Oki C831TS Digital Color Printer 4-Color Process transfer paper printer. Prints vibrant, high-quality color graphics, text on white, light-color or hard surface transfer media. Breathtaking color for lower cost of operation. Enhanced HD Color Printing - Single Pass Color technologies - Straight-through paper path.